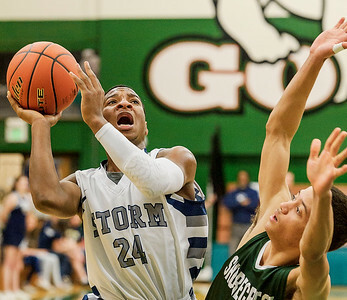 Squalicum's Damek Mitchell (24) goes up against Shorecrest's Malcolm Rosier-Butler during the first quarter in the 2A District 1 Boys Tournament Final on Saturday evening Feb. 20, 2016, at Mount Vernon High School in Mount Vernon, Wash. Mitchell scored 16 pints in the game as Squalicum lost to Shorecrest 56 to 62. 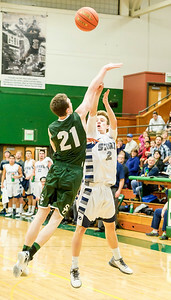 Squalicum's Ben Wolters (22) hooks one in over Shorecrest's Simon Acker during the second quarter in the 2A District 1 Boys Tournament Final on Saturday evening Feb. 20, 2016, at Mount Vernon High School in Mount Vernon, Wash. Wolters scored 2 points in the game as Squalicum lost to Shorecrest 56 to 62. 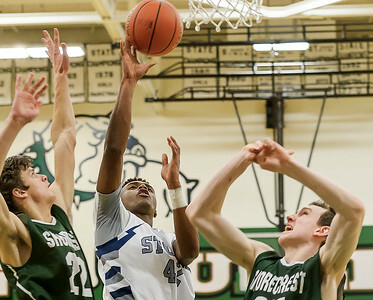 Squalicum's Josiah Westbrook (42) against Shorecrest's Aubry Victor (22), left, and Tobyn Lawson (21) during the second quarter in the 2A District 1 Boys Tournament Final on Saturday evening Feb. 20, 2016, at Mount Vernon High School in Mount Vernon, Wash. Westbrook scored 11 points in the game as Squalicum lost to Shorecrest 56 to 62. 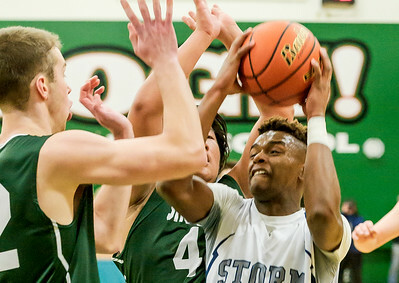 Squalicum's Josiah Westbrook (42) shoots over Shorecrest's Steven Lin during the first quarter in the 2A District 1 Boys Tournament Final on Saturday evening Feb. 20, 2016, at Mount Vernon High School in Mount Vernon, Wash. Westbrook scored 11 points in the game as Squalicum lost to Shorecrest 56 to 62. Westbrook left the game late in the second quarter with a knee injury. 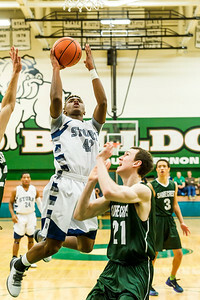 Squalicum's Josiah Westbrook (42) shoots against Shorecrest's Simon Acker (32) during the second quarter in the 2A District 1 Boys Tournament Final on Saturday evening Feb. 20, 2016, at Mount Vernon High School in Mount Vernon, Wash. Westbrook scored 11 points in the game as Squalicum lost to Shorecrest 56 to 62. Westbrook left the game late in the second quarter with a knee injury. 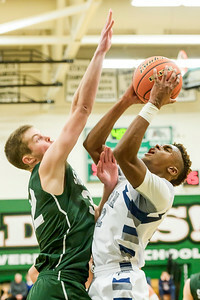 Squalicum's Josiah Westbrook (42) pulls down a rebound against Shorecrest in the 2A District 1 Boys Tournament Final on Saturday evening Feb. 20, 2016, at Mount Vernon High School in Mount Vernon, Wash. Westbrook scored 11 points in the game as Squalicum lost to Shorecrest 56 to 62. Westbrook left the game late in the second quarter with a knee injury. 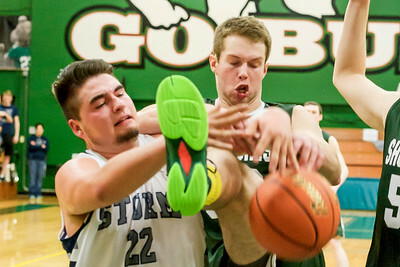 St22 Sc32 Squalicum's Ben Wolters (22), and Shorecrest's Simon Acker (32) battle for a rebound during the second quarter in the 2A District 1 Boys Tournament Final on Saturday evening Feb. 20, 2016, at Mount Vernon High School in Mount Vernon, Wash. Wolters scored 2 points in the game as Squalicum lost to Shorecrest 56 to 62. 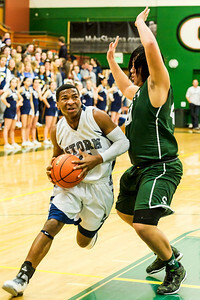 Starting point guard Josiah Westbrook left the game late in the second quarter with a knee injury after scoring 11 points. 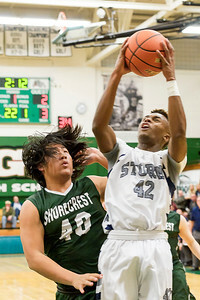 Squalicum's Damek Mitchell (24) drives around Shorecrest's Steven Lin (40) during the second quarter in the 2A District 1 Boys Tournament Final on Saturday evening Feb. 20, 2016, at Mount Vernon High School in Mount Vernon, Wash. Mitchell scored 16 points in the game as Squalicum lost to Shorecrest 56 to 62. 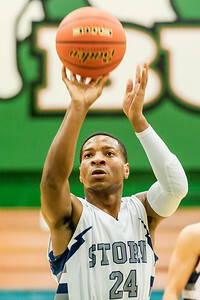 Starting point guard Josiah Westbrook left the game late in the second quarter with a knee injury after scoring 11 points. 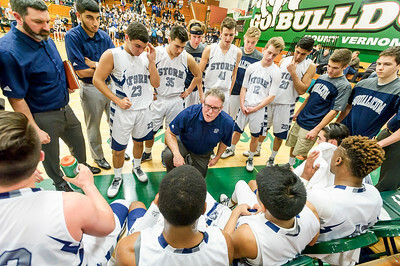 Coach David Dickson, center, guides the Squalicum squad during a timeout against Shorecrest during the second quarter in the 2A District 1 Boys Tournament Final on Saturday evening Feb. 20, 2016, at Mount Vernon High School in Mount Vernon, Wash.
Squalicum's Darius Powell (23) shoots for two against Shorecrest late in the second quarter of the 2A District 1 Boys Tournament Final on Saturday evening Feb. 20, 2016, at Mount Vernon High School in Mount Vernon, Wash. Powell scored 2 points in the game as Squalicum lost to Shorecrest 56 to 62. 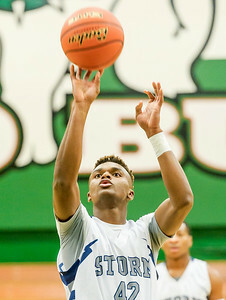 Starting point guard Josiah Westbrook left the game late in the second quarter with a knee injury after scoring 11 points. 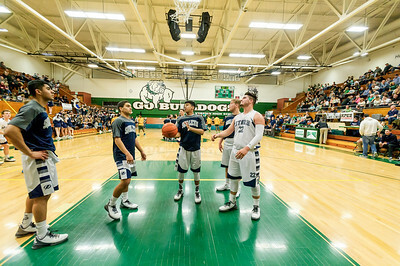 The Squalicum squad practices for their game against Shorecrest in the 2A District 1 Boys Tournament Final on Saturday evening Feb. 20, 2016, at Mount Vernon High School in Mount Vernon, Wash. Squalicum lost to Shorecrest 56 to 62 as starter Josiah Westbrook left the game late in the second quarter with a knee injury. 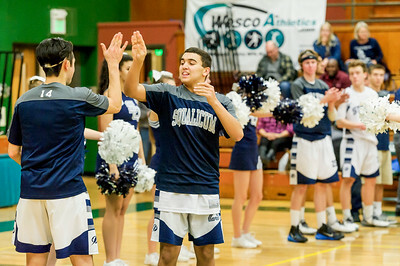 Squalicum's Josh Vail (14), left, greets Josiah Westbrook as he is introduced before their game against Shorecrest in the 2A District 1 Boys Tournament Final on Saturday evening Feb. 20, 2016, at Mount Vernon High School in Mount Vernon, Wash. Westbrook scored 11 points in the game as Squalicum lost to Shorecrest 56 to 62. Westbrook left the game late in the second quarter with a knee injury. 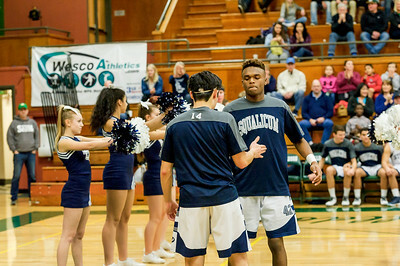 Squalicum's Josh Vail (14), left, greets Darius Powell (32) as he is introduced before their game against Shorecrest in the 2A District 1 Boys Tournament Final on Saturday evening Feb. 20, 2016, at Mount Vernon High School in Mount Vernon, Wash. Squalicum lost to Shorecrest 56 to 62 as team mate Josiah Westbrook left the game late in the second quarter with a knee injury not to return for the second half. 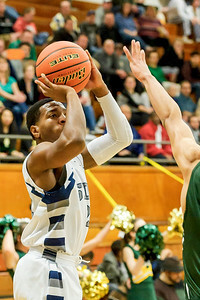 Squalicum's Josiah Westbrook takes a shot against Shorecrest during the first quarter in the 2A District 1 Boys Tournament Final on Saturday evening Feb. 20, 2016, at Mount Vernon High School in Mount Vernon, Wash. Westbrook scored 11 points in the game as Squalicum lost to Shorecrest 56 to 62. Westbrook left the game late in the second quarter with a knee injury. 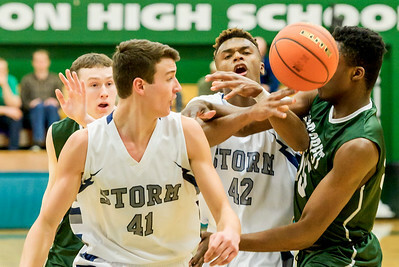 Squalicum's Giovanni Melley (41), left, watches as Josiah Westbrook (42) try to control a loose ball against Shorecrest in the 2A District 1 Boys Tournament Final on Saturday evening Feb. 20, 2016, at Mount Vernon High School in Mount Vernon, Wash. Westbrook scored 11 points in the game as Squalicum lost to Shorecrest 56 to 62. Westbrook left the game late in the second quarter with a knee injury. 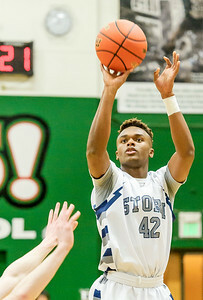 Squalicum's Josiah Westbrook (42) shoots a free throw against Shorecrest in the 2A District 1 Boys Tournament Final on Saturday evening Feb. 20, 2016, at Mount Vernon High School in Mount Vernon, Wash. Westbrook scored 11 points in the game as Squalicum lost to Shorecrest 56 to 62. Westbrook left the game late in the second quarter with a knee injury. 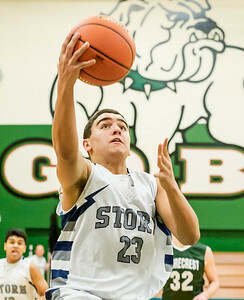 Squalicum's Damek Mitchell attempts a three-point shot against Shorecrest during the first quarter in the 2A District 1 Boys Tournament Final on Saturday evening Feb. 20, 2016, at Mount Vernon High School in Mount Vernon, Wash. Mitchell scored 16 pints in the game as Squalicum lost to Shorecrest 56 to 62. Team mate Josiah Westbrook left the game in the second quarter with a left knee injury. 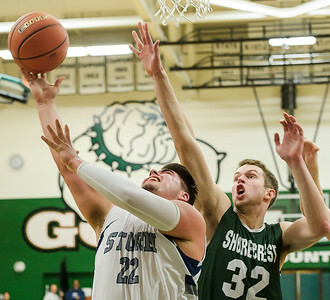 Squalicum's Damek Mitchell (24) shoots a free throw against Shorecrest in the 2A District 1 Boys Tournament Final on Saturday evening Feb. 20, 2016, at Mount Vernon High School in Mount Vernon, Wash. Mitchell scored 16 points in the game as Squalicum lost to Shorecrest 56 to 62. Team mate Josiah Westbrook left the game late in the second quarter with a knee injury. Squalicum's Josiah Westbrook (42) shoots over Shorecrest's Tobyn Lawson (21) during the second quarter in the 2A District 1 Boys Tournament Final on Saturday evening Feb. 20, 2016, at Mount Vernon High School in Mount Vernon, Wash. Westbrook scored 11 points in the game as Squalicum lost to Shorecrest 56 to 62. Westbrook left the game late in the second quarter with a knee injury. 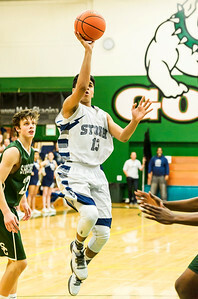 Squalicum's Simran Parmar (13) shoots for two against Shorecrest late in the second quarter in the 2A District 1 Boys Tournament Final on Saturday evening Feb. 20, 2016, at Mount Vernon High School in Mount Vernon, Wash. Parmar scored 14 points in the game as Squalicum lost to Shorecrest 56 to 62. Parmar replaced point guard Josiah Westbrook who left the game late in the second quarter with a knee injury after scoring 11. 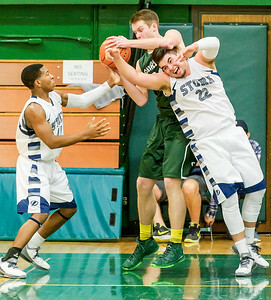 Squalicum's Damek Mitchell (24), left, and Ben Wolters (22), battle for a rebound with Shorecrest's Simon Acker (32) during the second quarter in the 2A District 1 Boys Tournament Final on Saturday evening Feb. 20, 2016, at Mount Vernon High School in Mount Vernon, Wash. Mitchell scored 16 and Wolters scored 2 points in the game as Squalicum lost to Shorecrest 56 to 62. Starting point guard Josiah Westbrook left the game late in the second quarter with a knee injury after scoring 11 points. Squalicum's Noah Westerhoff (12) shoots for 3 over Shorecrest's Tobyn Lawson (21) during the final minute of the second quarter in the 2A District 1 Boys Tournament Final on Saturday evening Feb. 20, 2016, at Mount Vernon High School in Mount Vernon, Wash. Westerhoff missed the shot and scored 0 points in the game as Squalicum lost to Shorecrest 56 to 62. Starting point guard Josiah Westbrook left the game late in the second quarter with a knee injury after scoring 11 points.